Kids & Zo opened its doors in May 1992. 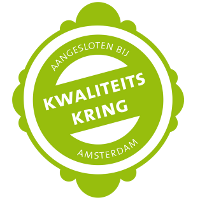 Our three daycare centers are Kids & Zo Centrum, Kids & Zo Baarsjes and Kids & Zo Amstel. These daycare centers are managed by pedagogic director Jessica Haije, financial director Mark Valentin and two location managers by each daycare center. We work with a team of professional group leaders and a domestic employee by each daycare center. At Kids & Zo, we work with three group leaders a day. The norm in Holland is two leaders. A very important issue is the communication between the child and the group leader and between the group leader and the parent(s). We offer a large scala of activities, with the main focus on creativity and good hygienic circumstances in a spacious day care center. Kids & Zo has one baby group (the Baarsjes has 2 baby groups) at the age of 3 months to 15-18 months, and two toddler groups (the Baarsjes has 3 toddlers groups) at the age of 15-18 months until 4 years old. Day care centers have to observe the rules and regalements of the community, all written down in “Verordening op de Kindercentra”. Likewise Kids & Zo is inspected every year by the GGD and by the fire departement. Parents are represented in the parental commission. Kids & Zo is open from Monday to Friday from 07.45 to 18.30 o’clock. You can bring your child between 07.45 hrs and 09.45 hrs and pick him or her up between 16.30 and 18.30 o’clock. For the convenience of the children in the group, it is very important that this schedule is being observed. If you have problems bringing or picking up your child by troubles not foreseen it is best to call us. The day care is closed for four weeks a year; three weeks during the summer (summerschoolholiday) and one week between Christmas and New Year. On the commonly accepted holidays Kids & Zo is also closed. Your child is welcome at Kids & Zo for one day a week with a maximum of five days a week. This price includes diapers, fruit, food, drinks, baby powder, cream etc. You will receive a monthly invoice which will be paid in advance and will be booked off your account. Costs for day care are partially tax-deductible. The parental contribution is € 9,68 per hour (2019). This amount can be adjusted every year. The parental contribution is € 9,83 per hour (2019). This amount can be adjusted every year. If you are pregnant and would like to register your child, you can fill in a registration form. You are welcome to make an appointment and come by for a tour on the day care center and to get acquainted with the staff. When your baby is born, we would happily receive a birth announcement card on the following address: Swammerdamstraat 40hs 1091 RV in Amsterdam. Your baby will than be registered permanently. The consequence of the large amount of interested parents is that we are forced to work with a waiting list. Besides this we also look at the age balance in a group. Because of this it is possible that a child that was registered later is enrolled sooner. We also give precedence to children whose brother or sister is already placed at Kids & Zo. As soon as a place is available we will contact you. Of course you can always call for some information yourself. When we can confirm a place we will invite you for a second visit, where we will talk about the enrolment and set up a parental contract. If you decide you no longer want to be on our waiting list, please inform us so that other parents get a change too. Overtaking or flexible switching days is not possible. However there is a possibility to, besides the days agreed to, reserve a whole or half day extra, provided there is a place. You can request this day in advance or ask in the morning of the day extra care is needed. Of course the day will be paid as normal. If you come one day a week than you can exchange that day ones a year, two days a week than you can exchange twice a year, three days a week than you exchange three days a year etc. if the planning allows this. The agreed monthly fee needs to be paid also for the days Kids & Zo is closed, for example on bank holidays and summer break. If your child is ill or you are on holiday you also need to pay. We bill you for twelve months a year. To terminate the day care you must consider a notice period of two months. This notice needs to be send to us in writing and by the first of the month. Requests for changes in the existing contract need to be done two months in advance with the office manager on Kids & Zo. We will try as good as possible to fulfill your wishes. The most important goal we have at Kids & Zo is that the children are comfortable and that they are having fun. Our pedagogic point of view is a combination of structured and spontaneous activities. We assume that every child develops at his own pace and that we can stimulate this development. The day care center is no school; your child is here to play in a structured way with other children. By playing with children in their own age group and participating with different activities your child will develop social skills. Your child is of course free to do something else if he or she does not want to participate with an organized activity. However, participating is always stimulated, not forced. With our pedagogic approach we try to connect to the situation at home. It is important for the children that the transition between the day care center and the home situation is as smooth as possible. This applies for example on eating and sleeping schedules, potty-training, correcting and rewarding a child, and offering standards and values. Kids & Zo will have slightly different rules on occasion, but these differences will be overlapped as much as possible in accordance with the parents. This is why good contact between the group leaders and the parents is so important to us. In the morning we always take time to drink a cup of coffee or tea and exchange information about the children. At the end of the day we always tell what we have done that day, how your child has played and what he or she thinks about that day’s activities. Besides this there is a “hobby-case” in which a group leader will write about your child and save his or her artworks. At Kids & Zo there is always time for a conversation. You can consult us on educational issues and there is also literature available on pedagogic issues. When your child switches from the baby to the toddler group we will make an appointment to talk about the transition. We also do this when your child reaches the age of three years. An observation or conversation can always be requested in the meantime. In an observation we discuss playing, motor-, cognitive- and social development. We try to stimulate the children’s development of social skill and independence. A lot of toddlers want to do certain things for themselves, for example dressing themselves, or going to the bath room. Helping out the group leaders is something toddlers also love to do, for example setting up the lunch. It gives children a great sense of self-respect. A child cannot be a danger to itself or to others. Some materials, for instance books, need to be handled with care. During eating and drinking the children sit together at the table and only begin eating when we finished “the” song. When one toddler hurts another toddler we give this serious attention. They learn to stroke/caress each other, give each other a kiss, and when they are a bit bigger they learn to say “I am sorry”. When a toddler is really naughty we give him or her a “time out” and he or she will be put on a chair by him or herself in the playroom for about two minutes. Because the difference in development between a four month old baby and a two year old toddler is too big we have a separate baby group. The ages vary from four till eighteen months. The baby group requires more care and individual care than the toddler group; therefore we enroll ten babies per group. Just like on the toddler group, the baby group has three group leaders a day. This way the attention your baby will get is optimal. When your baby is about 15 months he or she will be transferred to the toddler group, sometimes a bit sooner, and sometimes a bit later, depending on your baby’s development and depending on if we have a place. Of course all of this is done in accordance with the parents. About a month before actual transfer we slowly let your child get adjusted to the new group and environment (we do this using a so called adjustment schedule) just like in the baby group. In the toddler group we have chosen for a group of children in different age and development phases. The age varies from 15 moths till four years old. The benefits of such a mixed group are that the younger children can learn from the older children, for example language on development. The older children learn to be responsible and careful with the younger children. This is a situation which is similar to a situation at home. Aside from this the children will stay together in a group for two and a half year. An important focus point on the toddler groups in Kids & Zo is that the group leaders divide the group in two or three smaller groups to do activities. The children can be divided based upon age for example. This way of working assures that the children get more personal attention and that the different age groups do not disturb each other’s activities. An important part of our pedagogic approach is the adjustment period for the baby- and toddler groups. Because it is very important that your child feels at home at Kids & Zo, we devote a lot of attention to the first weeks in the new environment. We especially look at the following issues: Giving babies their bottle-feeding can be difficult at first because the baby needs to get used to a new face. Besides this it can be difficult for them to get used to sleep in a new environment. You and your child come to Kids & Zo and meet the group leaders. We exchange information about sleep and eating habits, any special diets or allergies your child may have. Your child will play with the group leaders while you are near. After some time you will leave and we will see how your child reacts. Your departure is very important. Turn it into a ritual, where waving from behind the window can help your child accept that you left. In accordance with the group leaders you can stay a little bit longer on the first morning. During the whole habituation period it is pleasant if we are able to call you when you are not here. Of course you can always call us too, also when habituation period is over. Every group has its own telephone number. The first day is usually until 11.30 hrs. This goes for the baby as well as the toddler group. This day will be the same as the first day, accept that your child will stay one hour longer. Your child can stay a little bit longer than the first two days; you can pick him or her up at 15.00hrs if everything goes well. If the first three days have gone well, your child will stay with us until 16.30hrs. It is pleasant if during the first habituation period you can adjust your daily activities. Keep in mind that for a period of two or three weeks you need to pick up your child at irregular hours. This also depends on the amount of day a week your child will come to Kids & Zo. In some cases a longer habituation period is needed. The amount of time it takes for your child to get adjusted also depends on your child’s temperament, experience on an other day care center or experience with a baby sitter at home. We are aware of the fact that not just your child but you also need to adjust to the new situation. If you have any questions about how everything works at Kids & Zo, you can contact one of the group leaders or deputies. Before the transition from the baby to the toddler group there will be a transition meeting. In this meeting we will inform you on the ins and outs of the toddler group. There will also be a transition phase again where we start with a few hours a day and gradually go to full days. This way your child has the opportunity to get used to the new group, with new children and new group leaders. What does a day at Kids & Zo look like for your child? The baby group has a very flexible daily routine, because every baby has his or her own schedule. Between 07.45 hrs and 09.45 hrs you can bring your baby in. You can take a cup of coffee or tea and there’s the possibility to exchange information with the group leaders. At 09.45 hrs we all sit at the table and drink and eat something, we’ll sing some songs and tell some stories. After that the diapers are changed. Because we will keep to eating and sleeping schedules similar to the ones at home, some children will go to sleep. The other children will be playing in the playing room. We also go outside on a daily base, where the babies have their own part of the garden, or go for a stroll. At 12.00 o’clock we will have lunch with the children who are big enough to eat a sandwich. The other get their bottles at the by the parents indicated time. Between 16.30 hrs and 18.30 hrs you can pick up your baby and the group leader will tell how the day went. Between 07.45 hrs and 09.45 hrs you can bring in your toddler. We do puzzles with them or read books at the table, or they go play by themselves. The parents can take a cup of coffee or tea and there’s the possibility for them to exchange information with the group leaders. At 09.45 hrs we put all the toys together with the children and the last parents will leave. At 09:45 hrs we all sit at the table and drink and eat some fruit, we’ll sing some songs and tell read stories. After changing the diapers or going to the bad room, we organize an activity. This activity is done with the group as a whole or with smaller groups with their own group leaders. We can go for a walk, play in the garden, play games at the table or go hobbying in the big hall in the basement for example. At twelve o’clock we will have lunch and after that we brush the children’s teeth. After this the children are changed and most children then sleep between 13.00hrs and 14.30hrs. With the bigger children, who do not sleep anymore, we do quiet games like memory, reading or coloring. Naturally the children are also allowed to play by themselves. At 15.30hrs we all have a drink and eat something. After this we will organize another activity together or in smaller groups. At five o’clock we will sit at the table again to drink, eat and read for the children. Between 16.30 hrs and 18.30 hrs you can pick up your toddler and the group leader will tell how the day went for him or her. Kids & Zo emphasizes creativity. Children like finger-painting, model claying, drawing etc. In our day care center we have the different group where we can do activities like this but also a very spacious hall in the basement. While playing the children learn the difference between different shapes, colors and measurements. The result of the creative activities is not important, for us working with different materials is important. The toddler groups work with themes like: animals, traffic, children’s book week, colors etc. Kids & Zo organizes music exhibitions. The music teacher “Liedjestovenaar” comes in to a group, and will take a different kind of instrument with her every time. The children can walk around, listen, touch the instrument, etc. This way the children will experience different kinds of music instruments and music styles. The music teacher plays once a month for babies, as well as toddlers. Kids & Zo also offers a weekly children’s theater for children of 2 years and older. The children dance, sing, fantasize, impersonate, and go crazy under supervision of Katelijne van Duffel, teacher in dance and expression. In this theater themes are used for the children, like animals in children’s book week, “Sinterklaas”, fairy tales etc. Since sports are just fun and healthy, and overweight on primary schools is an increasing problem, we find it very important to do a lot of sports with the children. For that reason once in two weeks sporting lessons will be given to the children. Under supervision of Els Visser the children will experience all kinds of sport and game activities. Kids & Zo give dance lessons for toddlers from 2 years old. The children dance, take different attitudes and make music. All this under the guidance of Yolanda Potman, dance teacher. Fine motor toys: a rattle, toys for in the playpen, activity centers, box of bricks, books and music, musical instruments etc. The toys are of good quality. The furniture, games and puzzles are made of wood and the toys are manufactured in bright colors. What are you supposed to bring? Lunch consisting of brown sandwiches and crackers, cheese, cream cheese, peanut butter, sausage, salami, pate, apple marmalade, cucumber, tomato, boiled egg, frankfurter sausages, tosti’s and every once in a while pancakes. The fruit snacks are made from seasonal fruits and are freshly made. In between meals we eat ricecrispies, evergreen cookies, raisins, bread sticks and we drink apple lemonade (dixap). If your child has any allergies or a special diet we can of course change the menu. Hygiene is very important in our day care center. We have a domestic employee who cleans up the lunches, changes the sheets and cleans the group rooms, the bad rooms and the kitchen. Once a week a cleaning company comes to clean all the floors. The beds are changed once a week. The beds in the babies sleeping room have a cover sheet which is changed every day. The children receive a clean towel every day, which is used with changing the diaper. The diapers are changed at least four times a day. Before eating the children’s hands are washed and after eating their teeth are brushed and the hands and faces are washed again. In the entrance there are plastic shoes you can put over your own shoes when you enter the baby groups, this way the floor stays clean for the crawling babies. Toddlers can come when they have the chicken pocks, provided that they feel good enough. With the babies we are more careful. If your child is ill and cannot come please let us know before 09.00hrs. We would also like to receive a call when he or she is feeling better again. In case your child falls ill while at the day care center we will contact you immediately. We understand that having to pick up your child so suddenly can create problems for you, however, our priory at that moment is with your child. Furthermore we have to prevent the other children, the group leaders and other parents from getting ill. We will only contact you when we feel it is absolutely necessary. Therefore it is very important that you leave us a phone number where we can always reach you, or someone close to you. We have a regular house doctor connected to Kids & Zo, so we can call him for advice when needed. We also consult the GG&GD when needed. We will effect an accident insurance for your child. Kids & Zo is not liable for any accidents that are not covered by this insurance. For information about company contracts or invoices you can contact us.